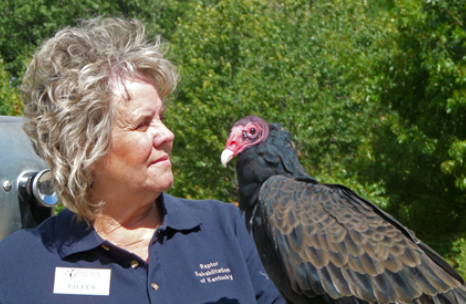 Vultures - Raptor Rehabilitation of Kentucky, Inc.
Two kinds of Vultures can be found in Kentucky, the Turkey Vulture and the Black Vulture. In Europe there is a large dark hawk called "bussard." When European settlers came to America, they saw our large black vultures and thought they were seeing the familiar European bird, so the European word changed to "buzzard." In fact, the New World vultures, including Turkey and Black Vultures, and several species of Condors, are not at all related to the Old Word Vultures in Africa, Europe and Asia. This is an example of convergent evolution, or form following function. Vultures have developed bald heads to be able to keep clean easily after sticking their heads inside the body of a dead animal, since they are all scavengers and feed on animals that are already dead. No, they do not circle over a dying animal. They are looking for a carcass that already smells. They soar on warm air currents, with wings that are almost 6 feet wide from tip to tip, holding their wings in a slight V, and rocking back and forth. Under the right conditions they can soar for up to 6 hours without flapping their wings! Although they have excellent vision, they are searching for the odor of a carcass with their sense of smell. Most birds have a poor sense of smell, but a Turkey Vulture can smell a dead mouse under the leafy forest floor, with a full canopy of leaves on the trees, from a height of 200 feet. You can see completely through their beak where the air enters their nostrils. Turkey Vultures can be easily identified by their red heads. While in flight, however, look for a silver lining on the wings and under the tail, along with a V-shape silhouette. The Turkey Vulture is Nature's Garbage Man. Turkey Vultures can eat the meat of animals that died of disease and not get sick themselves, because of special enzymes in their stomachs. If they are frightened while feeding on the ground, they may not be able to fly off quickly because they are so large. So they vomit their meal to scare away any threats, a very effective defense. Remember, they found their food because it smelled bad, then it was digested for a while, then regurgitated - and boy, does it smell bad! But when the threat is gone, they return and re-eat what they threw up! Turkey Vultures are often seen with their wings outstretched, warming themselves in the morning sunshine, and baking off any remaining food bits from their feathers. Turkey Vultures do not built a nest, but lay their eggs directly on the ground, perhaps under an old log or bramble bush, or in an abandoned house or barn. The chicks are fluffy white, with black head and legs. Their parents have very weak feet and cannot carry food back to the chicks, so they gorge themselves, then fly back to regurgitate the food into the chick's open mouth. In the meantime, the chicks are left alone on the ground, where they are sometimes found and bird-napped by people. Black Vultures on the other hand, do not have a good sense of smell. 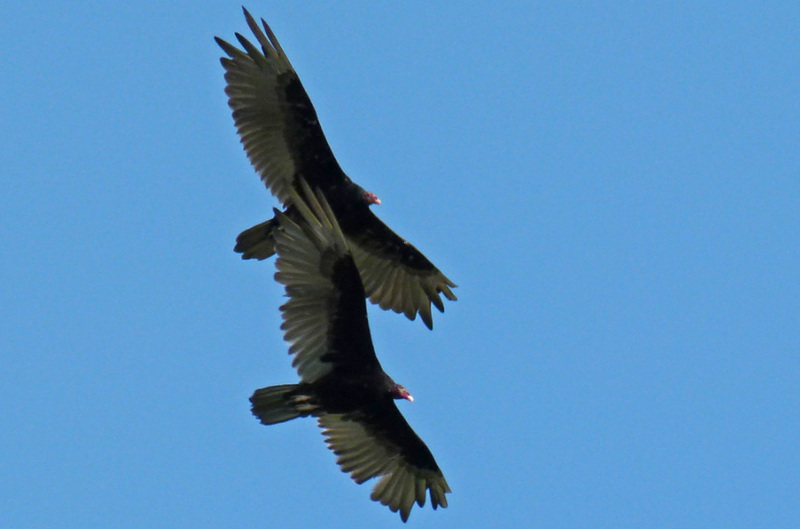 The easiest way for them to find food is by watching the Turkey Vultures, and chasing them off when they find a carcass. Black Vultures also have a reputation for killing new calves and colts born out in the fields. They have black heads instead of red, white spots only at the tips of their wings, and a short tail. Due to a shorter wing-span, they have to flap more often in flight than the Turkey Vulture. All vultures are social birds, and will be found in groups squabbling over a carcass or roosting in a tree at night. "Aeolus" was the Greek god of the wind, so it's a perfect name for our education Turkey Vulture. Eo was bird-napped when he was a fluffy white chick in 1992. The person thought he would keep the bird as a pet. Eo became a human imprint and is terrified of other vultures, including little chicks! Many regard Eo as the most intelligent and "crafty" of the birds at RROKI. He is well known for biting volunteers when they try to handle him, or ambushing people who enter his flight cage. Eo first lulls his victims into a false sense of security by appearing to ignore them, then attacks from behind. His cage bears a plaque saying "Beware of Attack Bird!" We threw him a big party when he turned 21. Kachina is named for a Hopi Indian spirit and shares a large flight cage with Eo. We received a call from a vet in Bullitt County, and when we picked him up, found him in a wire cage next to a Doberman, and clearly terrified by the dog. His broken right wing had healed incorrectly, and some surgical wire remained in the wing. He cannot fly well enough for release and lived with another rehabber for a few years, then returned to RROKI in 1999. Kachina and Eo have reached an agreement to stay at opposite ends of their large cage. Kachina likes to climb up the pantslegs of volunteers who enter the cage.